Yep, another celebration - today is National Heavenly Hash Day! Most people might think ice cream at the mention of Heavenly Hash - a chocolate and vanilla ice cream mixture with marshmallow swirls, and almond and dark chocolate chunks. A more old-fashioned rendition of heavenly hash is a salad-type dish with nuts, crushed pineapple, miniature marshmallows, sour cream and cool whip. But if you're like me, you think pie. Heavenly Hash a.k.a Millionaire Pie is a southern classic. There are many variations on the recipe but they all include crushed pineapples, nuts, and cool whip. Here's one with maraschino cherries from Spicy Southern Kitchen. It looks decadent, especially with the medley of ingredients including 'golden nuggets' (pineapples) peeking through the fluffy white concoction, hence the names Heavenly Hash or Millionaire Pie. In a medium bowl, mix together graham cracker crumbs, melted butter, and sugar. Press onto bottom and sides of a 9-inch pie pan. In another medium bowl, mix together drained crushed pineapple, sweetened condensed milk, cherries, pecans, lemon juice, and cherry juice. 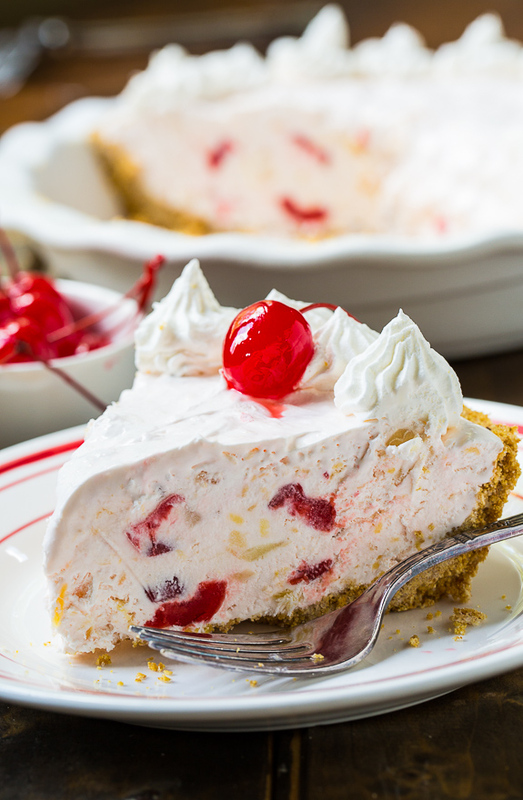 Serve with extra Cool Whip and cherries.